I was scared, I was really scared. I never wanted to be the novice hiker that needed to be rescued. I then wondered, do they even do that here in Ecuador? I was standing on a slanted ledge looking up at the wall in front of me that I needed to scale. Below me were scrambles that I barely climbed and knew I could not get back down. There was no turning back. We hoped that the next climb would take us to the top, to a real trail, but we had hoped for the same thing in about the last five scrambles. We started our hike today on a beautiful cobblestone trail that lead to the Peguche falls. It is a peaceful little hike surrounded by a quiet forest. The sweet scent of pine adorned the cool morning breeze. After spending time gazing at the 60 ft high waterfalls from many angles we continued up the trail to the top of the falls. And then we took a wrong turn. What appeared to be a short scramble to the trail ended up being a series of climbs leading to a small vertical wall which we presently faced. Trin had climbed up the first short scramble to make sure the trail continued. I told him I could make it up but not back down. There appeared to be a trail above it so we both ascended. Even on this narrow trail I could not look down or I would start to tingle. That short scramble ended up being the easiest one on the straight way up the mountain. The surface was covered with loose dirt and gravel making it easy to slip. We did not have any climbing gear with us, nor did we know how to use them. If we slipped there would really be nothing to stop our fall all the way down. If someone goes missing on a trail in Ecuador I wonder how long it takes for them to be found. We told our host this morning before we left that we were headed to the falls and then to the lake. I’m pretty sure they would grow concerned if we did not show up at “home” tonight. They are a very kind, older Kichwa Indigenous couple, Jose and Marina, who have been married to each other for over 50 years. They wear the beautiful traditional dress of the Kichwa People and run an artisan shop on the first floor of their home. “My great grandmother lived in one of those,” Marina told us. The works of art on display and the history depicted in the artwork on the walls are fascinating. Jose led a tour of the place one afternoon and spoke of the history of his people. The Kichwa people were indigenous to this area long before the Incas invaded their region which began in 1463. The Kichwa people resisted colonization until the 1500’s. Incas had minimal time to influence the Kichwa before the invasion of the the Spanish Conquistadors landed in Ecuador in 1531. Still the Kichwa peopole persisted with their unique language and culture. They even resisted the Spanish making it difficult for them to keep enough labor in their forced textile factories. Jose spoke of how his people were also skilled at getting along with the invaders, which I believe is partly how they were able to retain their own culture. They knew where to make a little compromise while still retaining a tradition. For example some of their ancient heroes were forcibly given Spanish names, maybe even given a horse to show deference to the Spanish rule. But at home they know the true name of the hero that even now is still depicted in their artwork. This is how their culture has survived, the art of relationship. Artwork on the wall at Peguche Wasi. It depicts El Lechero, a hill on which stands the ancient tree where married couples were instructed to go and talk if they were having difficulties. There is very little divorce in the Kichwa culture. Relationships are important to them. In our brief time with Jose and Marina we felt at home and felt that they truly cared that we were comfortable and enjoying our time in their beautiful country. They would offer advice of places to go and warn us about places that are a bit more dangerous. I’m sure they would notice if we did not come home tonight. I think. I was happy to hear that, but this was a wall, and it was a very long drop to the bottom of the canyon from here. I began to climb and reached for Trin’s foot near the top. He was securely hanging from a strong tree root. I pulled myself up onto the ledge and was so happy to see a small road at the top. When both my feet were finally on a flat surface I began to brush off the brambles and the dust that covered me from shoulders to shoes. The view from the top was beautiful, it was worth the climb. 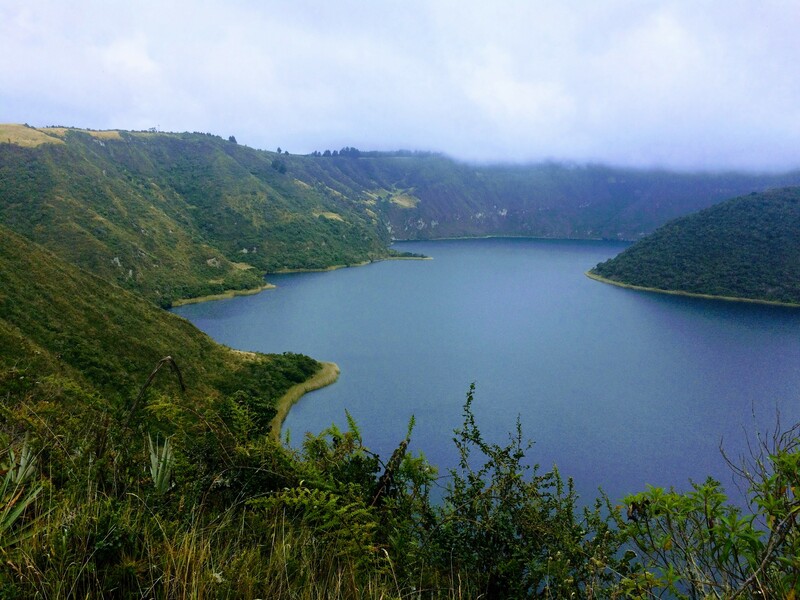 We continued on to San Pablo Lake and then explored downtown Otavalo. I’m thankful that neither of us slipped. Each day and each moment we decide how much risk to take. Often the greater the risk the greater the pay off, but not always. Today I was happy with the payoff, but I won’t be taking that “trail” again. Tour of Peguche Wasi. 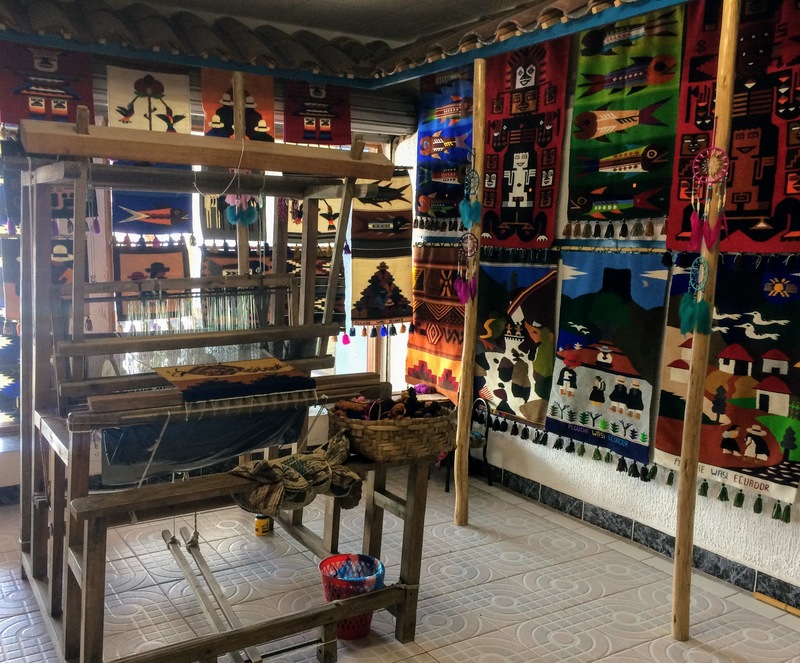 If you are looking for hand made blankets, scarves and other textiles this is the place to purchase them as well as see how they are made. Take a walk to the Peguche waterfall. Be sure to stop in the solar calendar/echo chamber just before the walk begins. It is a very unique reverb. 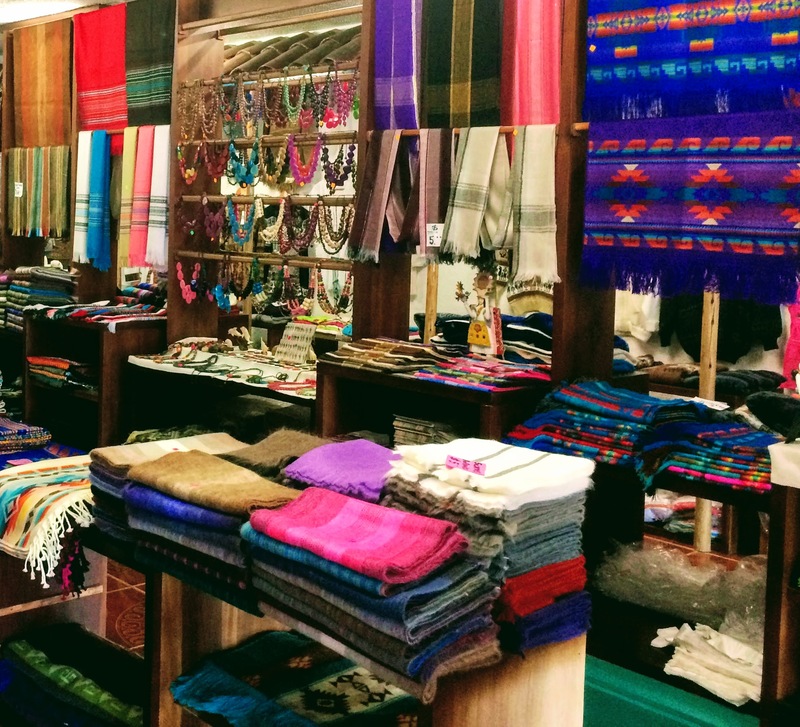 Go to the Otavalo Indian market on Saturday. Many bloggers suggest going on a slow day to avoid the crowds, but then you miss all the wonderful street food. 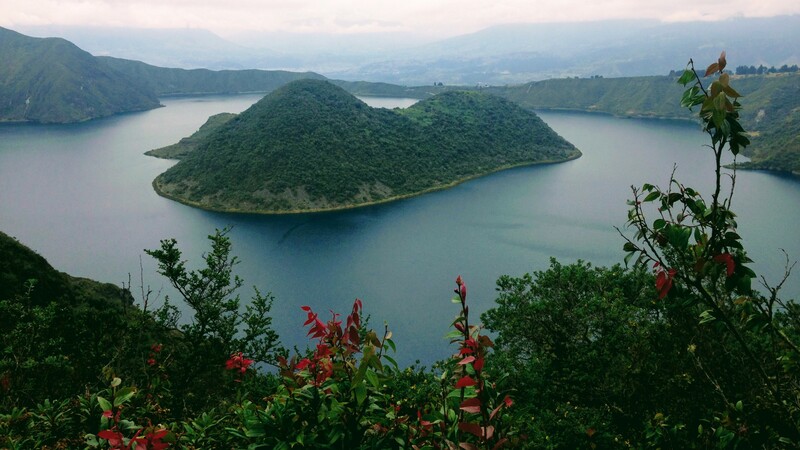 Take a walk around Cuicocha Lake. It is a beautiful ridgeline walk around a crater lake. Great views the entire way. ❤️ To follow your adventures! Glad you are safe! Glad you guys made it to the top safely! It sure sounds scary. Just one thing.. Can we call them indigenous people instead of Indians? Since they don’t actually come from India nor have Indian heritage. Otavaleños, if you want to be really specific since there are many indigenous groups all over Ecuador. Sure I can make that change, but they do use that word as well when referring to their markets etc. I know that the origin of the word is incorrect but it has been adopted and the meaning changed from its original.